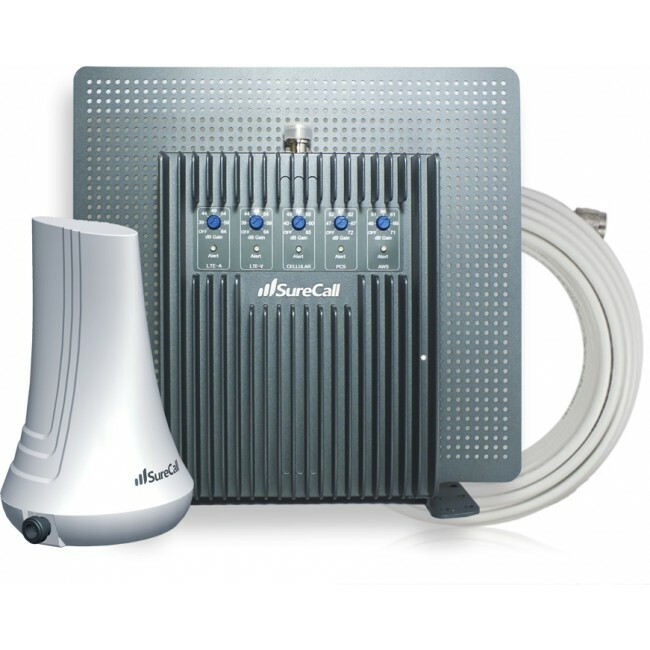 The SureCall Simple Setup Signal Booster Kit has been discontinued and replaced by the new and improved SureCall EZ 4G. 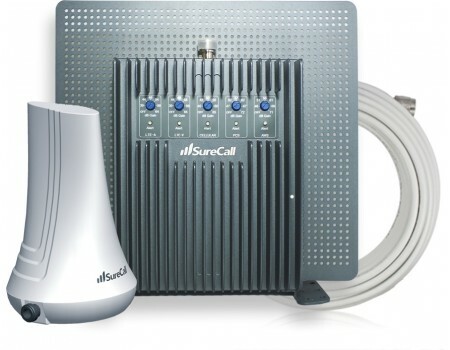 The SureCall Simple Setup Signal Booster kit is specifically designed to boost cellular signals inside a condo, apartment, dorm, or anywhere else where you're not able to mount an antenna outside of the building. The unit features a combination amplifier and "external" antenna that is designed to sit inside on a window sill where you get at least some existing signal. From the window unit, there is a cable that runs to either a desktop or panel antenna, which broadcasts the boosted signal to the inside of the building. The SureCall Simple Setup's unique side shielding prevents oscillation (feedback) between the antennas by keeping the boosted signal from reaching the external antenna facing the window. 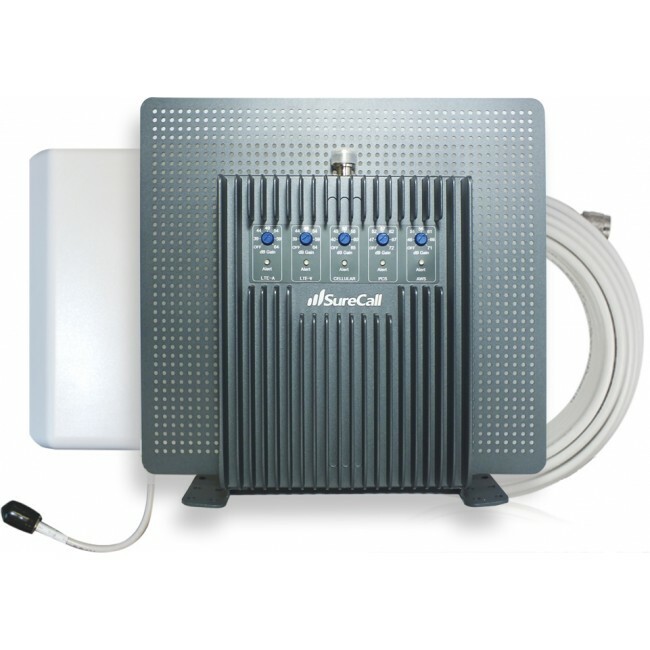 The SureCall Simple Setup will boost the voice, 3G and 4G LTE networks for most carriers in North America, giving you greatly improved voice calls and high speed data. The SureCall Simple Setup Signal Booster Kit is designed for use in the US and Canada, though it may work in other countries as well. The SureCall Simple Setup signal booster will not work in most European, Asian, and African countries because the frequencies used there are different from what are used in North America. If you would like to confirm if the SureCall Simple Setup will work for you, please first contact your carrier to find out exactly what frequencies are used in your area, then contact us and include those frequencies in your question. The SureCall Simple Setup signal booster kit installation is incredibly easy, and should only take you a a couple of minutes to setup. First, locate the window in your home or office that has the best existing signal. You can do this by holding your phone up to each window for 30 to 60 seconds and seeing how many signal bars or dots you get. Once you've determined the window with the best existing signal, simply place the window unit in the window, external antenna side facing out and dials facing towards the inside of the house. Connect the included antenna cable and then locate the inside antenna at least 15 to 30 ft away from the window unit. If you have the desktop antenna, then place it on a desk or table facing towards the inside of the house. If you have the panel inside antenna, then you can mount it on a wall facing away from the Simple Setup unit or on the ceiling facing downwards. Finally, plug in the window unit and you should immediately have boosted signal.